When a newborn comes into your house, a lot of other things associated with the baby have to come along. From skin care to furniture, your baby needs extra attention and care and hence it is very important to choose the product with diligence. 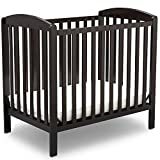 Baby cribs or baby beds are an unavoidable inclusion for your baby, so when you plan on buying one, you should have a clear understanding of the product well. 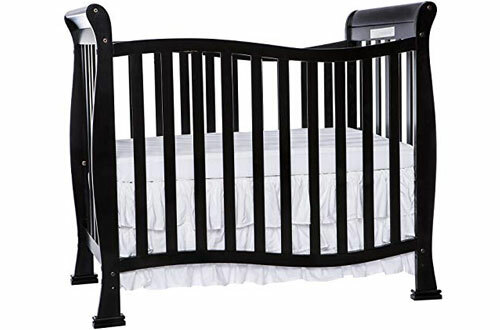 Here we have figured out the best baby crib and explained them with proper features. Although each product is different with a unique set of abilities, all are top-grade cribs for sure. Have a look at the list when you want to buy one and save yourself the horror of getting confused in the sea of products. It’s a beautiful sight to watch your baby sleep peacefully on the crib. 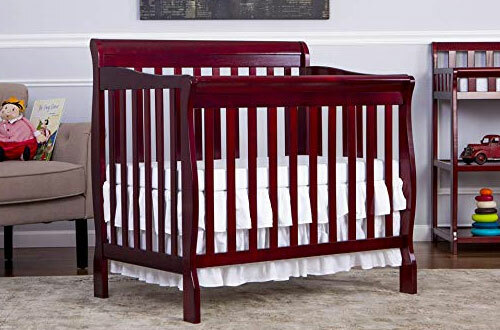 The convertible baby crib is where your baby spends a lot of alone time and this it really needs to be something that you can put your trust on. 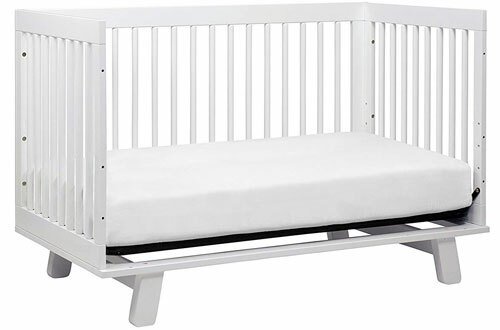 Designed with non-drop side stationary rail design, the crib is extremely safe and sound. Also, it has an appealing solid pine wood finish that matches perfectly with the robust looks to become more presentable as well as complement the aesthetics. Along with that, it has a 3-position adjustable mattress support system that makes it more flexible for you as a parent. When your baby grows, the bed can be easily transitioned into a toddler day bed and twin size bed, thus serving you more purposes than one. Sits low to the floor and make it easy for you to reach your baby. Can be transformed into daybed as well as twin size bed. 50 pounds of maximum weight capacity. 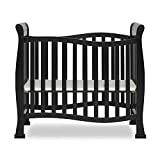 Have the assurance of the strength of New Zealand pine wood, this baby crib frame promises the safety of your baby in a great way. It has a thoughtful spindle side pattern which gives you the option to have a check on your baby from all given angles. It has 4 different adjustable mattress positions that not only maximize the comfort of your baby but also takes good care of your comfort. 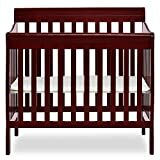 As per your need, you can convert the crib into a daybed or a toddler bed for more benefits. Moreover, a child’s safety is always guaranteed with the safety certification of ASTM and CPSC. Plus, it is approved by Greenguard after being tested against 10000+ chemicals as well as 360 VOCs. Safe from lead and phthalate contamination. Comes with the kit needed for conversion to toddler or daybed. Maximum weight capacity of 50 pounds. 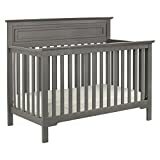 When you get this outstanding DaVinci baby crib with guard rails, you will actually aid in baby’s development. As it has four adjustable mattress levels, your baby’s safety is never compromised even when he or she is growing. From the toddler years to adulthood, the crib is easy to transform into a daybed, toddler bed and even a full-size bed. Timeless both in terms of looks and functionality, DaVinci is a smart and innovative crib that understands the need of modern generation. Also, it has a higher headboard combined with conventional and classic slat design for optimum safety and comfort. Plus, it involves a very detailed painting process for numerous steps in order to make it free of harmful elements. As the brand is concerned about nature, the woods are taken from sustainable forests. Hardware construction is hidden that maintains the aesthetic appeal. To maintain the traditional look, neat lines are integrated. 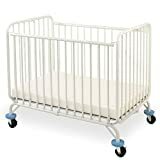 A travel baby crib that has exceptional application in everyday life, this is something that you can travel with and set-up almost anywhere for gifting your baby with ultimate relaxation. As this is a travel companion, you can assemble it almost instantly as it features a one second open and fold system. Also, the Quick Pull Up features allows hassle-free dissembling process. 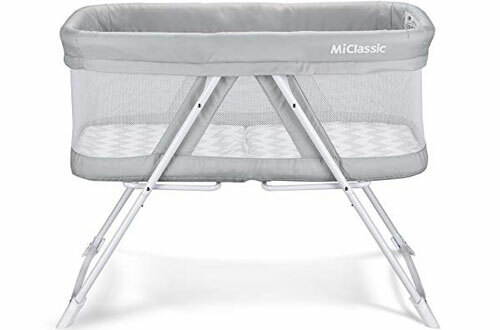 Further, it comes with a carrying bag in which you can fold the crib and carry with ease. 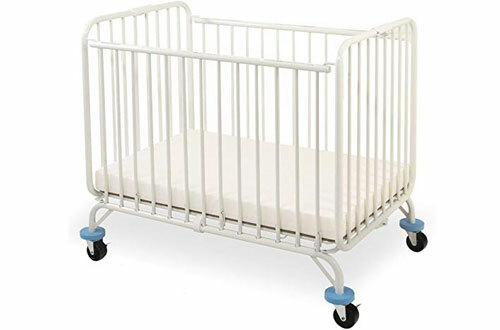 Perfect for travelling parents, this is a baby crib that takes care of all always. Has a rock mode and stationary mode that delivers high-end relaxation for your baby. Breathable mesh surrounds the bed which helps in air circulation, protection as well as communication. 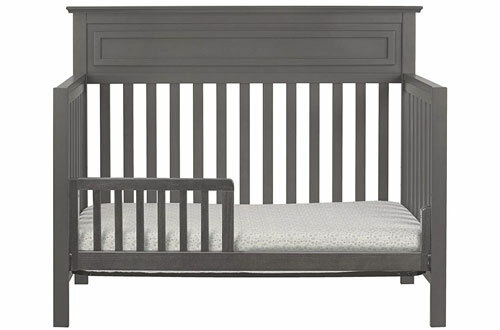 From the house of Dream On Me, the crib is versatile, highly-durable and extremely attractive. 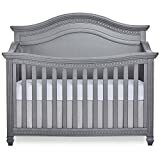 One thing that attracts almost everyone’s attention is the shape of the crib. By adding it to your child’s room, enhance the beauty while it promises to make life fun for your baby. Equipped with a three position mattress support system, as your baby grows the bed will keep adapting to your baby’s needs. Furthermore, there is a 1″ changing pad that comes along with the crib for added benefits. It is even tested for lead and other toxic materials, thus eliminating any risks of any health hazards. Solid pine wood makes it safe, reliable and long-lasting. Comes along with all the tools necessary for assembly. Can be transformed from a crib to a toddler bed to a day bed. In order to meet the needs of an urban family, the modern household demands furniture that is space-saving, safe and finished with highly premium looks. Having this in your nursery means you have something that is top-notch in terms of looks and extremely functional as well. The bed also has four wheels in the bottom which make it easy to move from one room to another, ensuring your baby stays close by always. Besides, the advanced design lets you fold into a compact fold. Now you can store and transport it whenever needed. Prepare your infant for a peaceful sleep as the baby crib mattress is 1-inches thick. Two-position mattress support system adapts to the growing needs of your baby. Wood construction promises sturdiness, stability and long-lastingness. Comes along with a mattress for more convenience. 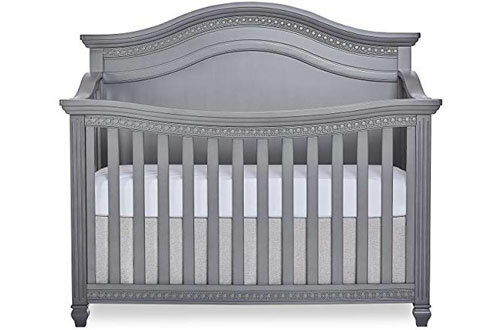 One of the finest options of convertible baby cribs in the market, this one features heavy-duty construction with supreme quality materials. Kiln-dried hardwood coupled with fine veneers used in the construction is long-lasting and exceptionally safe. In terms of functionality, you will get an adapting three height setting of a mattress to match the needs of your growing baby. The side rails on the crib are stationary and remain fixed for added safety. Along with that, the hardware is hidden, making it look even more beautiful to everyone. During the process of conversion, the back panel can be transformed into a headboard. Designed in accordance with the highest safety standards of ASTM & CPSC. Made suitable for converting to a toddler bed or daybed when required. 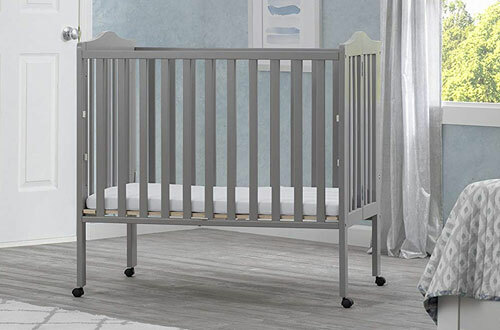 Delta Children brings to you a scale down design of a full-size crib that offers unmatched functionality and unparallel versatility at the same time. If your house is small and needs something that fits well while serving you totally, this is indeed the smartest choice. The classic styling of the bed coupled with arched styling complements the interior decor of any home very well. Furthermore, you can convert the crib to a twin size headboard to meet other needs. Along with that, the safety certification of JPMA gives you the peace of mind you would want in a baby product. The height of the mattress is subjected to two different adjustments. Assembling it is an easy job. As built of wood, the strength of the crib is not compromised. The Madison edition of the crib from Evolur is an example of elegance crafted in the simplest way. From details to function, every bit of the crib is well taken care of. 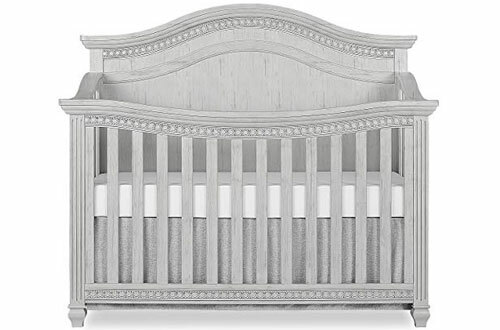 The fluted legs combined with sculpted fashion head and footboard appeals to parents who are looking to get the best for their baby. 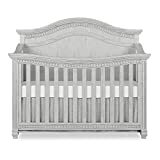 Moreover, all you need is a conversion kit to convert the crib to a toddler bed or day bed. 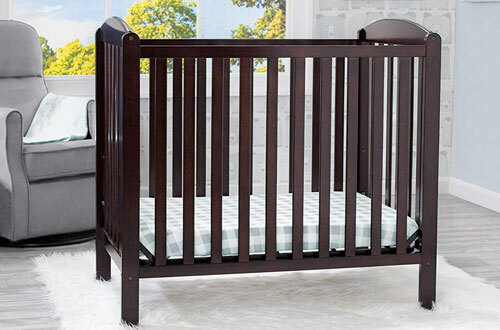 If you have a standard size mattress, this crib is well suited for your home. The exclusive feature of this product is that features a gender-neutral design. 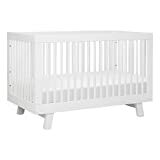 The 5-in-1 convertible crib comes in handy in numerous applications. 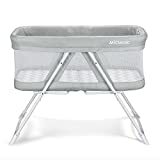 Featured at the very top of the list, this crib has all-metal construction with folding capabilities so that when you are not using it you can store it away safely. The white powder coat is non-toxic in nature and totally resistant against scratches. Also, for ultimate lateral rigidity, it has been designed with braced legs. The included foam mattress is deluxe and quite comfortable for your baby. At the bottom, there are foam bumpers which ensure zero damage to doorways and other furniture in your room. Side rails are stationary and support one position mattress. Lockdown safety floor system takes care of the safety factor of your baby. Heavy-duty casters help in manoeuvrability. Your baby is your reason for happiness. And ensuring their utmost comfort is your duty. Thus, only the best baby crib sets deserve attention.